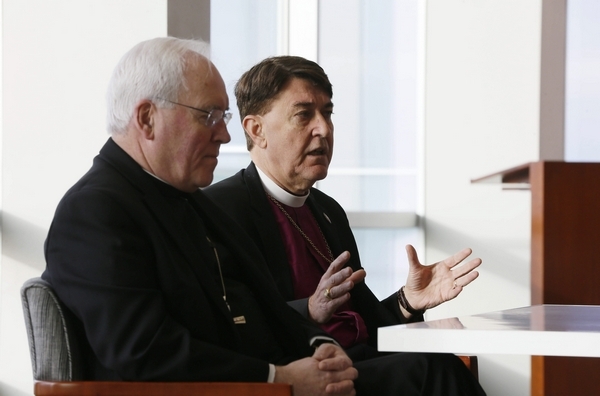 The bishops of Buffalo’s Catholic and Episcopal dioceses have written a joint pastoral letter urging church members to help make sure immigrants, minorities and the poor, among others, share in the region’s economic progress. While noting new development and revitalization in Buffalo, Bishop Richard J. Malone of the Catholic Diocese of Buffalo and Bishop R. William Franklin of the Episcopal Diocese of Western New York said not everyone is benefitting. “Blacks and Hispanics still live in poverty in greater proportion than do other groups in our population,” the two bishops wrote in the letter to distributed in churches this weekend. “Children still go to bed hungry. Jobs and security elude too many families.” In what they called a pioneering letter, the two called on business and political leaders to “further all efforts to make opportunities for employment, training and advancement that grow out of this hopeful time of growth and expansion accessible to all.” For all church members, “what we say and pray on Sundays must now go out into the world, into the workplace, to the ballot box and to the councils of government to ensure that Western New York becomes a more prosperous community, not only in dollars, but in our investment in each other,” they wrote. The letter marks the first time a Catholic bishop from Buffalo, leader of more than half a million Catholics, and the Episcopal bishop, who leads about 19,000 members, issued a joint pastoral letter. Fifty years on, it’s time for the ecumenical movement to take on a more pastoral mission and worry less about trying to untie the knots of history and theology, Saint Paul University theology professor Catherine Clifford told a small gathering of bishops, clergy and lay people in Toronto commemorating the 50th anniversary of the Second Vatican Council’s Decree on Ecumenism. 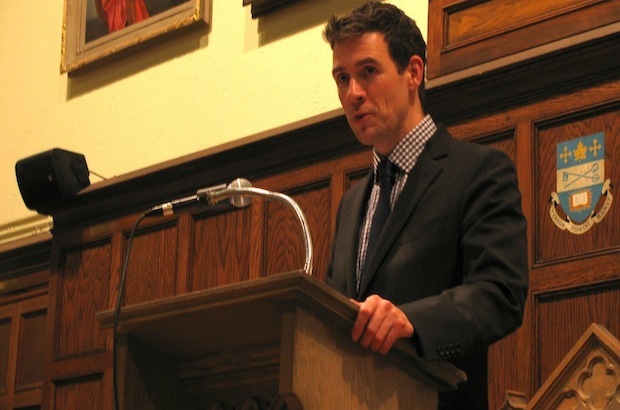 Clifford and Anglican ecumenist Archdeacon Bruce Myers were the featured speakers at a prayer service marking the anniversary sponsored by the Ontario Diocesan Directors for Ecumenical and Interfaith Affairs and the Assembly of Catholic Bishops of Ontario. 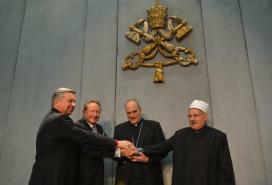 “We’ve lost sight of the pastoral importance of ecumenism,” Clifford said. 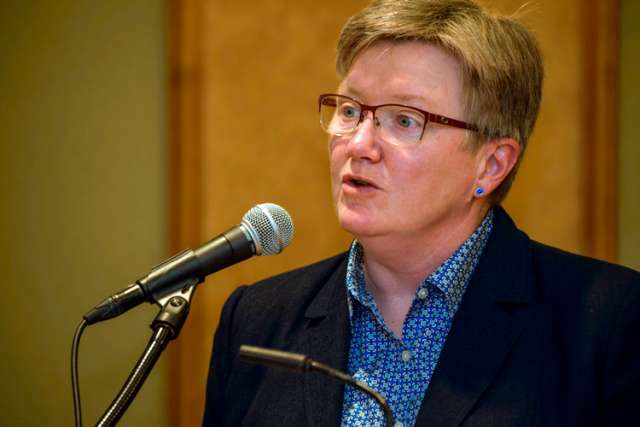 From interchurch marriages to dwindling communities that can’t survive in isolation, the Church’s ecumenical mission is urgent, she said. 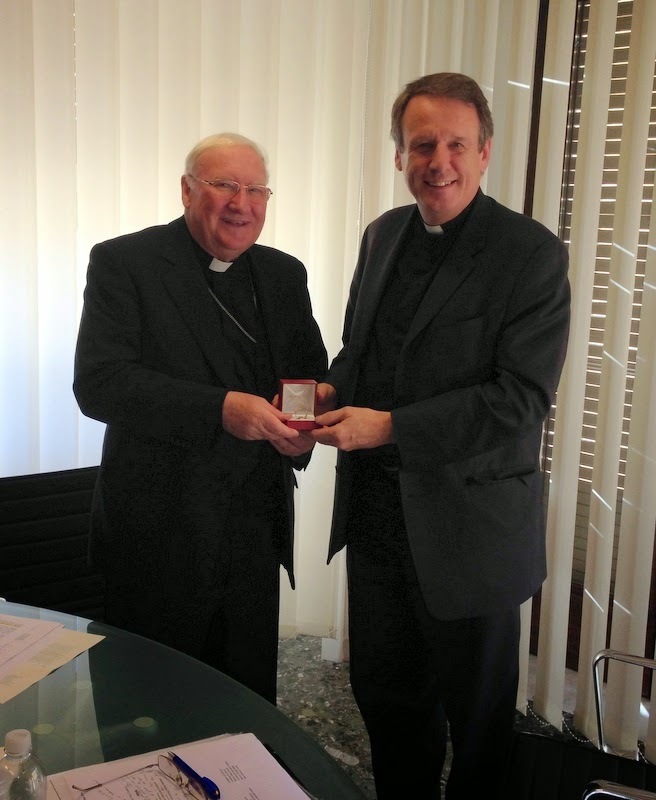 “A perception that it (ecumenism) has been the domain of professional ecumenists” must be overcome, said Myers. King Richard III ruled for two short years, between 1483 and 1485, before he was defeated by the future Henry VII during the Battle of Bosworth, according to Biography. The usurper’s son, Henry VIII, was the king who severed his country’s ties with papal authority, creating the Church of England which is now known around the world as the Anglican Communion. Historical sources suggested Richard was buried in the Grey Friars church, close to the battle site but far from his ancestral home in York. The church was destroyed in the 1530s and Richard’s gravesite remained lost for nearly 500 years. Two years ago, his bones were discovered in a Leicester parking lot. Richard is currently the only English monarch without a marked grave. Now, centuries later, Catholic and Anglican clergy are working together to give the last king of England’s Plantagenet dynasty a proper funeral. 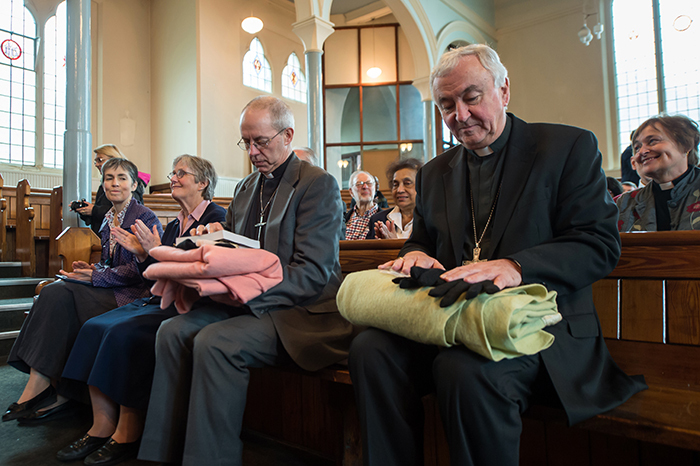 Anglican and Roman Catholic First XIs will face each other in Canterbury on 19 September in a historic match to raise awareness of slavery and human trafficking. 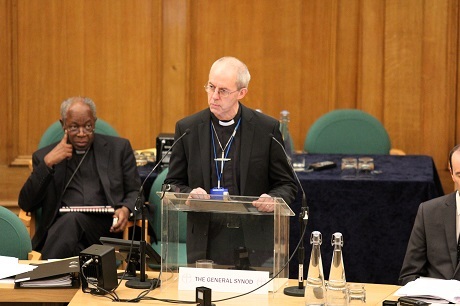 Details of a historic cricket match between Anglicans and Roman Catholics to raise awareness of modern slavery and human trafficking have been announced today. 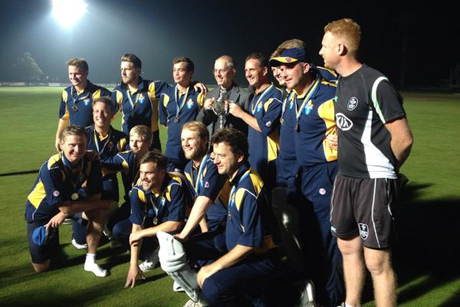 The Twenty20 match, which will be played at Kent County Cricket Club in the shadow of Canterbury Cathedral on 19 September at 4pm, will raise funds for the Global Freedom Network, the joint Anglican-Roman Catholic anti-trafficking initiative launched in March. Lambeth Palace Fig Tree Cutting: The Ficus carica ‘White Marseilles’ fig tree was brought to Lambeth Palace by the last Roman Catholic Archbishop of Canterbury, Cardinal Reginald Pole in 1556. It probably came from southern Italy where Pole spent a lot of time. The fruits are white fleshed and very rich and sweet, they are ripe when the skins turn a chartreuse colour and start to split. The Register of Cardinal Reginald Pole: This is a specially bound facsimile copy of two leaves from the Register of Archbishop. The images show the Archbishop’s coat of arms as both Cardinal and Archbishop, with both the papal Cardinal’s hat and the coat of arms of the Archbishop of Canterbury together, and then the elaborately decorated opening page of the Register itself. They come from the long series of archbishops’ registers (from the thirteenth century onwards) which are held by Lambeth Palace Library. The text is the opening of Pole’s register as Archbishop, which recites his various titles, such as Papal Legate and Cardinal-Priest of Santa Maria in Cosmedin. 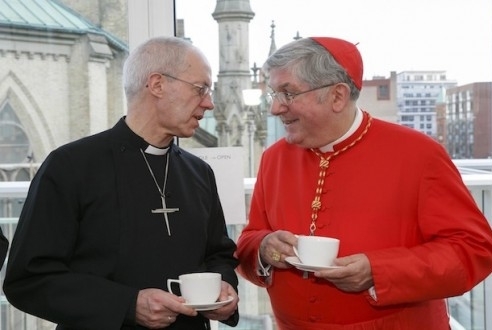 The Archbishop of Canterbury Justin Welby arrives in Rome on Saturday for a two day visit that will culminate on Monday in a meeting with Pope Francis in the Vatican’s Apostolic Palace. On Sunday the Anglican leader will preach at Vespers at the church of St Gregory on the Caelian Hill, visit the two Anglican churches here in Rome and take part in a prayer service with the St Egidio community at St Bartholomew’s on the Tiber Island. 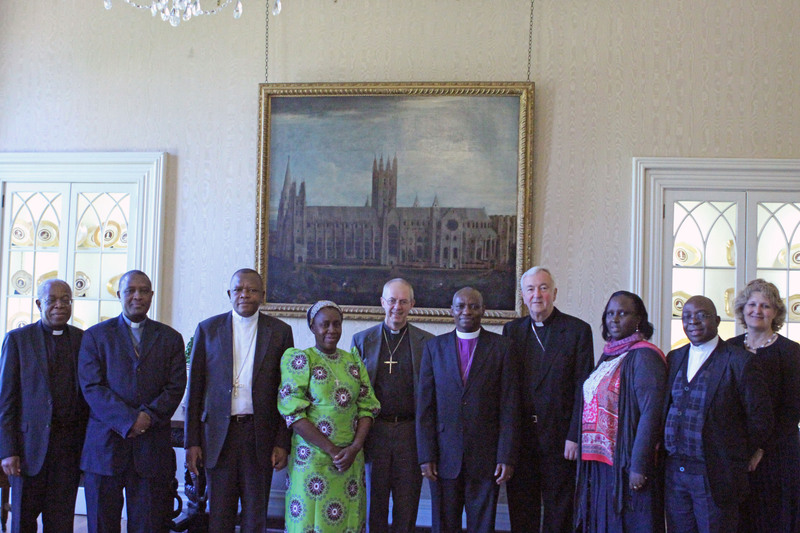 During his packed programme, the Archbishop will also launch a new website for the International Anglican-Roman Catholic Commission on Unity and Mission (IARCCUM), showcasing ways in which members of the two communions are increasingly worshipping, working and witnessing side by side. 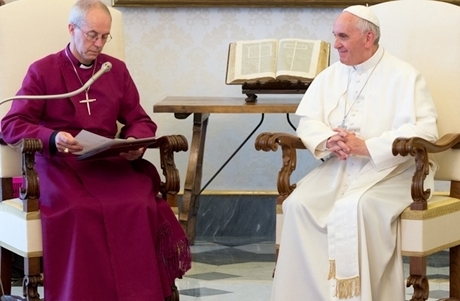 The Archbishop of Canterbury Justin Welby will meet Pope Francis in Rome next month.